The use of graywater to irrigate landscape plants is increasing throughout the United States, particularly in California and other arid states. In the United States, ”graywater” most often refers to wastewater that originates from residential clothes washers, bathtubs, showers, and sinks, and it excludes wastewater generated from kitchen sinks, dishwashers, and toilets (black water). All other systems require a construction permit prior to erection, retrofitting, construction and installation as stated in the actual code. The full text of these standards can be viewed at the California Department of Housing and Community Development (HCD) Division of Codes and Standards website, http://www.hcd.ca.gov/codes. Because these regulations may change at any time, always check with HCD and local enforcement agencies before developing plans for or installing a graywater system. Cities and counties can impose stricter guidelines than the state, so homeowners interested in installing graywater systems should contact their local jurisdiction for specific regulations concerning graywater handling and use. Laundry-to-landscape graywater systems are relatively simple to install and are inexpensive. The hose exiting the clothes washing machine is attached to a valve that separates graywater from water destined for the sewer. 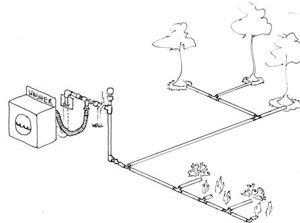 The graywater is diverted through a 1-inch main irrigation line with ½-inch tubing outlets placed throughout the landscape terminating in a valve box set in what is termed a “mulch basin” that surrounds plants being watered (see below). The washing machine pump distributes water directly to the landscape with no filter.A vacuum break or backflow prevention device may also be needed. Keep in mind that salt-free and boron-free liquid laundry detergents should be used for irrigating the landscape. In addition, chlorine bleach should be avoided. Read the full text and learn more about Use of Graywater in Urban Landscapes.